We’ve been keeping a keen eye on NetherRealm Studio’s followup to Mortal Kombat vs. DC Universe in Injustice: Gods Among Us (which still confounds us that no DC logo or brand name of any kind is in its title even now with the final box art). The latest news is that Injustice: Gods Among Us finally has a release date of April 16th, 2013 as well as two special editions. The Collector’s Edition of Injustice: Gods Among Us will sell for $99.99 and will include a copy of the game, a digital download of the DC Animated Film Doom, a three pack of DLC costumes for Superman, Batman and Wonder Woman based off of their DC New 52 designs, an Injustice comic and a statue of Wonder Woman and Batman in combat exclusive to this collector’s pack. It shouldn’t come as any surprise that Deathstroke would find his way into the new DC fighter from NetherRealm Studios (the team behind Mortal Kombat) entitled Injustice: Gods Among Us. While it is still strange that they have yet to put DC anywhere in the title of the game, it does make sense that they would choose to add DC’s top anti-hero to their roster. 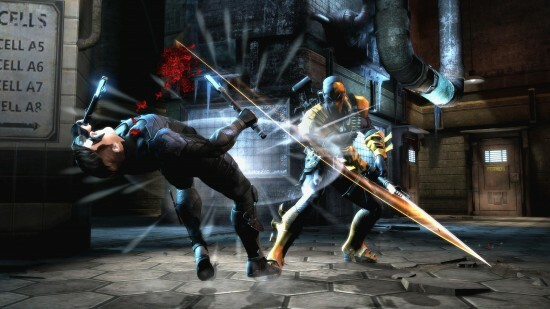 In the trailer below, you’ll see how Deathstroke’s personal arsenal of weaponry and fighting techniques lend themselves perfectly to the fighting game genre. Between his array of fighting styles and seemingly unending supply of guns and swords, this mercenary is ready for MK style combat. This also isn’t Deathstroke’s first fighting game appearance as he made his video game debut in Mortal Kombat vs. DC Universe as the DC counterpart to Baraka. This past week, gaming was abound with announcements at the Tokyo Game Show. The biggest announcement for both gamers and comic book fans was that Injustice: Gods Among Us is set to release in April of 2013. This means we will be getting Injustice well before Comic Con next summer (which sadly means no repeat of this summer’s Injustice party featuring Jessica Nigri). Injustice: Gods Among Us is the Netherreal Studios fighting game (the guys who made Mortal Kombat) being published by WB Games for those who haven’t been following. 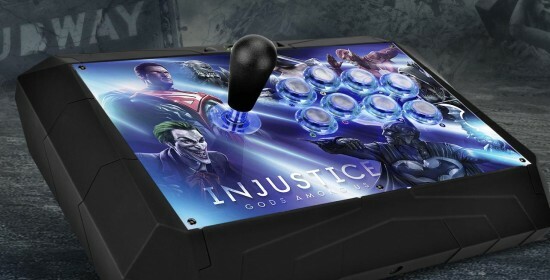 Along with the announcement of Injustice’s release date, a new gameplay trailer was shown as well. In the trailer, we catch a glimpse at some new seriously brutal moves. Everything from Wonder Woman calling in some Amazonian assistance to Nightwing using a motorcycle to aid in his beat down, the move sets look like they have been given a serious upgrade since these characters appeared in Mortal Kombat vs. DC Universe. What we can’t tell though because this gameplay footage doesn’t offer any context is if these are standard special moves or if these will be end of match moves, since fatalities won’t exist in this gaming universe. If these are those big finale moves though, there look to be some awesome minds working on the game to take the personalities of these characters and create such inspired scenes from them. Take a look at the trailer and new screens below for Injustice: Gods Among Us, set for release in April 2013 for the XBox 360, Wii U and PlayStation 3. In the comments, let us know who else you want to see join the cast of Injustice: Gods Among Us and what kind of brutal finisher you want them to have. For those fighting and comic gamers that have been living under a rock since SDCC, the makers of Mortal Kombat are bringing the DC Universe back to the realm of fighters with Injustice: Gods Among Us. While its odd still that there is no DC branding in the title, Injustice places some of the most popular members of the DC roster against each other in a T rated fighting arena. Creative director Ed Boon promises to push that T rating as far as he can given the limitations put in place by DC and WB Games. New to the cast along DC favorites like Batman, Superman and Harley Quinn is Catwoman. Between her longtime popularity amongst comic readers and the most recent role she placed in the Dark Knight Rises, it is almost a no brainer to put her in the game. Catwoman’s signature whip and claws are her main offense while she moves across the arena nimbly like an Olympic gymnast. Take a look at the full reveal trailer below to see Selena Kyle in action. Story details are still pretty up in the air for Injustice. There is going to need to be some strong outside force influencing heroes to face off against each other, similar to Mortal Kombat vs. DC Universe. They are also going to have to address the varied power levels of characters too. How is Superman going to get taken down by Batman just repeatedly punching him in the face? How is Solomon Grundy going to be able to even connect with a punch on the Flash? All of this will likely be addressed in the story to hopefully explain the gameplay balancing taking place.